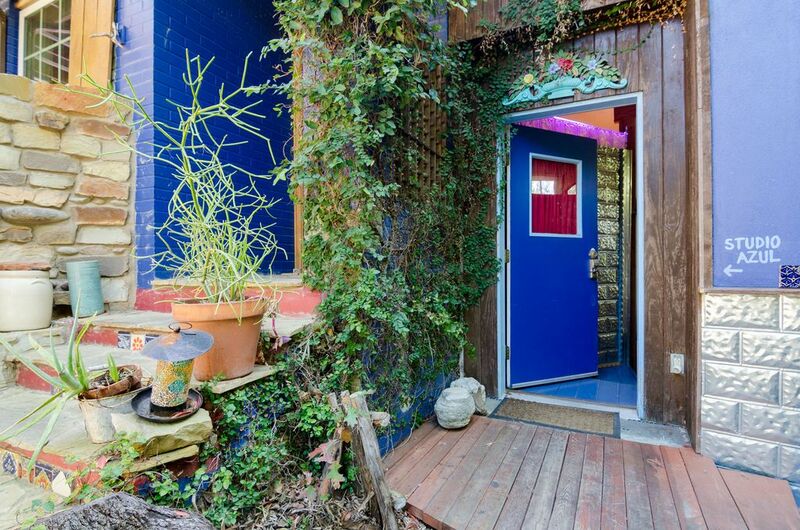 Cool Art/Living Space & Studio - Near Soco & Downtown!! Artistically inspired, 'Studio Azúl' is a truly unique property! It's on a heavily wooded lot in the middle of the rolling hills of Travis Heights. Surrounded by a lush garden, this place is a great getaway opportunity! Over 1000 square feet of art studio space. Perfect for traveling families or bands. Great for traveling artists in need of creative space....even if you're an individual traveler, this is a great wide-open space to relax (or work). Huge windows with forest views. Pets welcomed. Huge backyard deck awaits with two ponds! A very special bathroom that is a work of art . And we upgraded kitchen area too (larger oven and stove, more pots & pans) for our guests who want to stay in and cook meals. Within walking distance to South Congress, Austin's best entertainment district and within one mile of downtown! He's a filmmaker and veteran photographer; she's a boho crafty mama. We work really hard to make our units unique! There is an artistic touch everywhere you look. Not to mention, it's the best neighborhood in Austin. One mile from the heart of what makes Austin great! We have a beautiful neighborhood lined with trees and rolling hills. I sometimes forget how close we are to downtown because we're surrounded by a nature reserve area known as Blunn Creek. We are just several blocks south of Lady Bird Lake, and Downtown is just on the north side. Bar-height dining table and 4 chairs. 950 sq ft artist studio/apartment that sleeps 2 to 6 people. Two extras could sleep on single-sized cots if necessary. Photography and video lighting available for professionals. Ideal natural light studio! Kitchen cooking appliances upgraded! New master bed available in November 2009. We came down to Austin for 2 concerts. One at Stubbs on Friday night and one at Scoot Inn on Saturday. Great location for these and everything else you want to do in the city. Also, I can't fail to mention how neat the space is, also the grounds. Cool, clean and comfortable! Awesome place to stay for a quick getaway . We would definitely stay here again. Owner was quick to response and help if we had any questions. My friends and I come back here every spring because it is such a good shared space to hang out and connect! Highly recommend it! This is a fun, eclectic, unique place with a great backyard. Owners were awesome and very helpful and flexible for us. Will definitely be back! We had a great stay at Studio Azul on our annual Girl's trip with my mom, sister and niece. The room was very eclectic...especially the bathroom. The grounds were just amazing. And our hosts were very accommodating. Would definitely stay here again!! Only stayed here for one night, but the Owner allowed us a late check out, which was SUPER awesome. The place is small but laid out in a smart and cozy way. The outdoor area is shared, which is cool, just make sure if you bring a dog that they are people and dog friendly. Overall, loved the place, would stay again. For stays that are longer (four days or more) we may offer you a payment plan option. Please reach out to us to inquire about this.